Classified ads are $10 per week. Deadline for our ads is Tuesdays at noon. Please email your ads to ads(at)calistogatribune.com (please use the "@" symbol in the preceding email address - we have to write it out with the word "at" so that those darn internet robots don't hound us!). 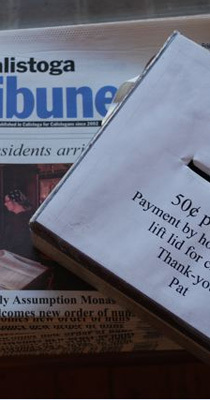 You can also mail your ads to: Calistoga Tribune, P.O. Box 1176, Calistoga, CA 94515 or fax them to 707.942.6508.